levelHead is a spatial memory game. The game takes its inspiration from the “Philosphical Toys” of 18th/19th century Europe and the memory systems (“memory loci”) of the ancient Greeks. levelHead uses a hand-held solid-plastic cube as its only interface. On-screen it appears that each face of the cube contains a little room, each of which are logically connected by doors. In one of these rooms is a character. By tilting the cube, the player directs this character from room to room in an effort to find the exit. Some doors lead nowhere and will send the character back to the room they started in, a trick designed to challenge the player’s spatial memory. Which doors belong to which rooms? There are three cubes (levels) in all, each of them connected by a single door. 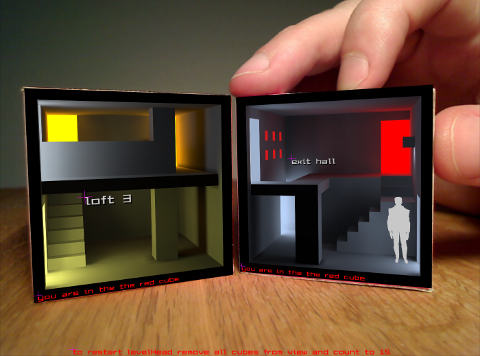 Players have as a goal to move the character from room to room, cube to cube, in an attempt to find the final exit door of all three cubes. If this door is found, the character will appear to leave the cube, walk across the table surface and vanish. Then the game starts over. Julian Oliver is a New Zealand born artist, free-software developer, teacher and occasional writer based in Madrid, Spain. He has presented papers and artworks at many international electronic-art events and conferences. Julian has given numerous workshops and master classes in game-design, artistic game-development, virtual architecture, interface design, augmented reality and open source development practices worldwide.